Our aim was always to create a photo-sharing platform with a difference – one that deliberately removes all the common social elements of sharing, following and commenting. The idea of stripping back photo sharing and removing features that can strongly influence user output and ultimately participation, really appealed to us. By exploring the concept of anonymity, we could create a social platform that wasn’t driven by the power of profile, influence, network, and status—but instead one where every user was truly equal, with exactly the same potential as anyone else to create and share content. So we created Rando as an experiment in anti-social photo sharing where serendipity rules the day and users send and receive random photos to and from random people all over the world. We wanted to make a photo app that was unique and gave the user something special. An unexpected view into someone else’s life. No filters. No likes. No comments. Just a peephole view of that single moment, captured and shared with a total stranger. Mobile photography is ubiquitous and photos remain the social exchange currency du jour. As social media users we were tired of the seeing the same old pictures of cats, babies and sunsets. We hypothesised that we weren’t alone and the average social media user is also bored of seeing a filtered view of the world. Our networks are closed off to new experiences. And people value the reaction to the photo, rather than the content itself. 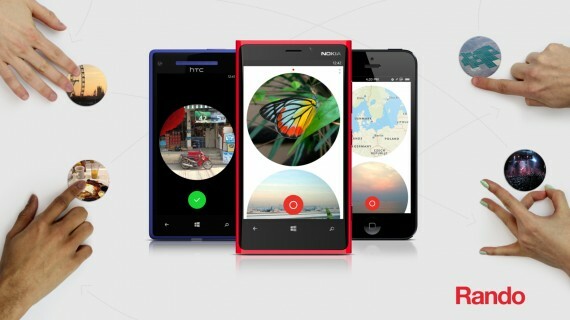 Rando is designed to quickly capture unique everyday moments. It’s fast, it’s deliberately simple and restricted in its functionality. With no ability to stylise, enhance, zoom or upload photos from other sources, the user can only take a picture of what is in front of them right at that exact moment. It forces the user to reconsider the purpose of the photo and why they are sharing it in the first place. Photos take on a new meaning to both the sender and receiver. Rando is aimed at a universal audience. Anyone curious enough to snap and share. We wanted Rando to feel completely inclusive and have international appeal. Anyone, of any age, on any smartphone, in any country can download and use it. The early success of Rando has been very encouraging. Since launching in March 2013 we’ve had over 550,000 downloads from all over the world and 15 million Rando images have been shared with complete strangers. Remarkably, only 0.1% of these have been flagged as inappropriate. Rando was an experiment. It was not intended to be directly revenue generating. We have invested only 2,000 hours into the project across all device releases. Its real value has been in generating profile and interest in the studio from the international tech and design community. Hey, we were even flown out to the DropBox Hackathon off the back of it. What has been most interesting for us is the way users have responded to Rando in social media. An app which is deliberately anti-social in its approach has spawned a myriad of blogs dedicated to Rando’s received. There are 50,000 images on Instagram tagged with #Rando. We can’t help but feel they’ve missed the point. The need to use photos as a social currency is still there, but instead of seeking more followers or craving likes, the need is to know more about the senders and the content shared. A curiosity has been awakened. 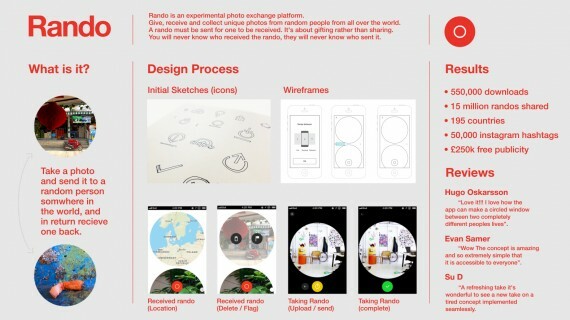 With Rando we used a ‘JFDI’ approach to both tech and design. We wanted to get it out there fast and see if it worked, even if it wasn’t perfect. Our rationale for all tech was based on speed and ease of use. We chose Ruby on Rails for the server side, hosted it on Heroku and used Amazon S3 suits to store files. We took the quick and easy road supporting only for iOS6 for the initial release. The intent of the Rando visual design was to keep user generated imagery the focal point. A super minimal UI was quickly constructed. We also challenged ourselves to keep text to a minimum. Labelling was communicated through simple iconography and universally recognised gestures. We wanted a Rando be a distinctive and own able branding element and used the circle design to represent a peephole. Functionality was also deliberately minimal in design. We constrained it to the basic task of taking a photo. We removed the ability to zoom, crop, filter or upload existing photos. The user is forced into taking a photo of exactly what they see in front of them. An instant, unfiltered snapshot of their world.